Federal Way City Hall is located at 33325 8th Ave. South, Federal Way, WA 98003; phone: 253.835.7000. Photo: Jovita Land Company Model Home (Corbett House), ca. 4600 S. 364th Street, Federal Way, WA. Located just outside the incorporated city limits. Listed on the National Register of Historic Places in 2004. Photographed by Joe Mabel (own work), 2009, [cc-by-3.0 (creativecommons.org/licenses/by/3.0)], via Wikimedia Commons, accessed July, 2014. Lying between Seattle and Tacoma, the area that would become Federal Way was first settled in the mid-1800s. It was incorporated as a city in 1990. The origins of Federal Way and its environs are closely linked to the creation of Military Road. Efforts to construct a route between Fort Walla Walla and various points on Puget Sound were begun by the United States military in 1852. The federal government agreed that access between Fort Steilacoom and Fort Bellingham should be established for the protection of settlers in the area. Growing impatience with the slow progress of the Puget Sound portion of the construction led Seattle pioneers in 1854 and 1855 to use construction volunteers. Once complete, the rudimentary roadway was little used and soon became overgrown. During the Indian wars of 1855-1856 the roadway was of little help in moving troops between Seattle and Fort Steilacoom. The poor condition of the initial route ultimately convinced Congress to appropriate $35,000 to construct a passable roadway between Fort Steilacoom and Fort Bellingham via Seattle. The upgraded roadway was completed in 1860 and became known as King County Road No. 4. The thick forest of the Federal Way area attracted few early settlers. Those who did build homes or log cabins primarily selected sites on Puget Sound or on the shores of the several lakes in the area. Some individuals settled on 160-acre homesteads or timber claims and small scale, subsistence farming was also undertaken by early settlers. Despite the Military Road, overland travel remained difficult and mail service (beginning in c.1879) was via boat to the small settlements on Puget Sound (known as Milton, Buenna, Stone's Landing and Redondo) and distributed by horseback. Commercial logging activity increased in the early 1900s and a few sawmills operated for a short period of time. 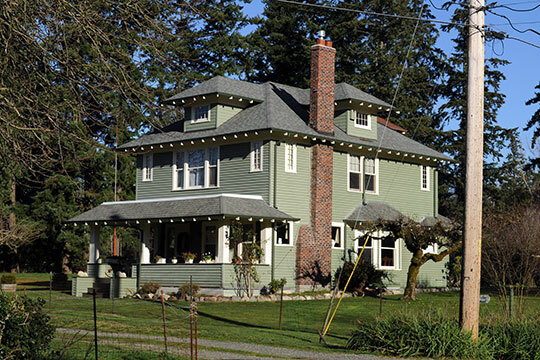 Land acquisition and subdivision increased during this period in anticipation of the residential growth spurred by the construction of the Seattle-Tacoma Interurban Railway completed in 1902. Among those subdivisions platted in the first two decades of the century were Maltby's Five-Acre Tracts, Algona, Lake Killarney Shore Lands, West Auburn Five-acre Tracts, Pacific City, Jovita, and Jovita Heights. The greatest stimulus for residential development of the largely rural area between Seattle and Tacoma was the construction of the Interurban Railway system. The Interurban Railway had its origins in downtown Seattle with the first electrified streetcars in 1889. As numerous independent lines were created in the ensuing years, consolidation became desirable to coordinate the array of unrelated rail lines. Stone & Webster Management Company, an engineering and energy-related consortium came to Seattle in 1898 and purchased the Snoqualmie Falls hydroelectric plant. The consortium retained a local banker, Jacob Furth, to acquire utilities and street railways in the area, an effort the company was undertaking around the nation. Within a year, Furth had purchased 22 streetcar lines, creating a virtual monopoly. At the time, Stone & Webster and its financial backers were in the process of pursuing the creation of a single entity controlling an entire electrical utilities and interurban transportation system from Olympia all the way to Vancouver, B.C. Phil Esser with the King County Historic Preservation Progam Staff, Jovita Land Company Model Home (Corbett House), King County, WA, nomination document, 2003, National Park Service, National Register of Historic Places, Washington, D.C.